In Milan students stay at the Residence Pian della Nave, via Lambrate 9, 20131 Milano, tel. +39 02 268 151. Click here for the Google map of the area. The Residence is a mile and a half from Stazione Centrale, the city’s main train station, and less than three miles from Piazza del Duomo, the very center of the city and less than three miles from Piazza del Duomo, the very center of the city. All double rooms have a private bathroom, free wi-fi, TV, air conditioning, and a fully-equipped kitchenette. In the building there is a laundry room with coin-operated washing machines and dryers. Residence Pian della Nave is a ten-minute walk to the subway station Loreto, then a twenty-minute ride on the M2 green line to station Romolo and IULM University, where classes are held. Click here for maps that show how to get to Loreto from Residence Pian della Nave and from Romolo to IULM. For transportation to IULM and to other locations in the city we’ll provide you with an ATM (Azienda Trasporti Milanesi) monthly pass (click here for more information). Students have access to IULM restaurant and cafeterias, open Monday through Friday but only for lunch. Use your prepaid card to lunch there. As the program officially starts on Sunday, June 16, you must check in at Residence Pian della Nave on the previous day, Saturday the 15th. If you need to arrive on Friday the 14th, please contact prof. Erspamer as soon as possible. We’ll move to Siena on Sunday, July 14. In Siena students are lodged in Il Refugio of the Collegio Santa Chiara, the collegiate residence of the University of Siena. Its address is: Via del Refugio, 4 – 53100 Siena – tel. +39 0577 280 376. 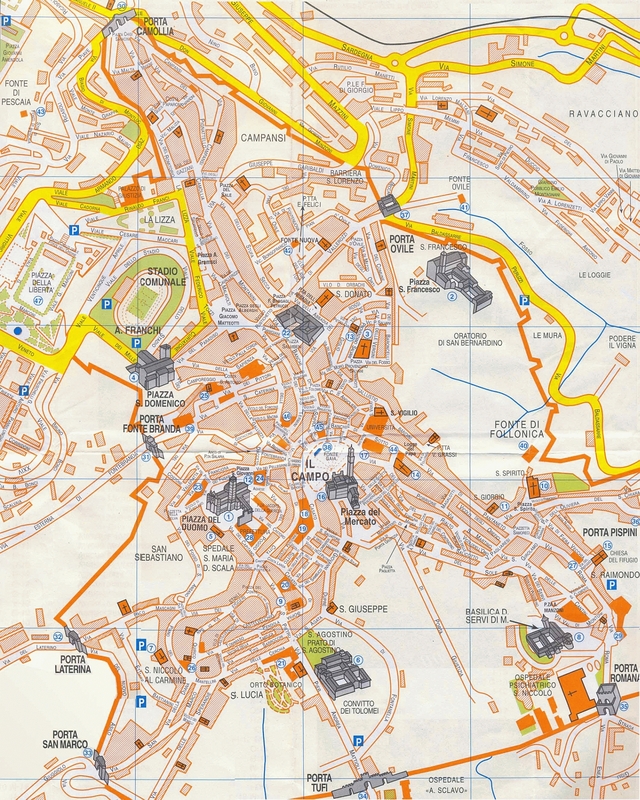 Click here to download a detailed map of Siena. The Refugio is very close to the Chiesa del Refugio (15), on the right edge of the map towards the bottom, below Porta Pìspini. This ancient building is in the historic center of the city—a less than ten-minute walk from Piazza del Campo. All double rooms have a private bathroom and free wi-fi connection (pretty slow in certain rooms and parts of the building). Students have access to the common areas of the Collegio, including a kitchenette, a computer room, a tea room, and the gardens. A washing machine and a dryer are available; there are clothes lines in a drying room below the roof. Rooms at the Collegio have been booked from Sunday, July 15, to Saturday, August 18. If you need to leave on Sunday the 19th, please contact prof. Erspamer as soon as possible. Classes are held in a university building nearby, the Palazzo San Niccolò. In Siena students will receive vouchers to be used in restaurants in the vicinity of the Refugio.